Whooo! Heart letter puzzles for Valentine’s Day. Learning all those tricky uppercase and lowercase letters is hard so let’s make it FUN and colorful any why not add some sensory experiences to it too. Play is the way kids learn best! We know this because that’s what the research tells us. Now I’m going to show you how to set up a play based letter game your kiddos will WANT to play again and again! Put it in a sensory tub! I LOVE putting letter and number puzzles in a sensory tub! It just makes it fun and interactive for kiddos. This tub is just pink and red rice with a few sequins and heart gems thrown in. Add strawberry smelly oils to the rice and it will awaken even more senses! Now if you have three year olds, only 5 to 10 letter puzzles (not the entire alphabet) so it’s not overwhelming. For my pre-k kiddos who are ready, I hide the all the letter puzzles or half of them. Hide the letter puzzles needed to make a students name. Then they find the letters and identify them (and even say the sound the letter makes if they can). After they have found all the letters they can create their name. Now that they have found all the letters and completed the puzzles, they can trace the letters (aka fun handwriting). Writing letters is important for little learners to do. The more they practice writing the letters, the more their motor memory develops! Don’t like worksheets? Laminate the page and have students trace the letters with their fingers or trace it with a dry erase marker. Need MORE fun Valentine’s themed literacy and math centers? I’ve got you covered so check out this post HERE and grab the FREE candy heart pattern strips. Check out this post HERE packed with my favorite Valentine’s Day books! LOVE these letter puzzles? Pin this image! 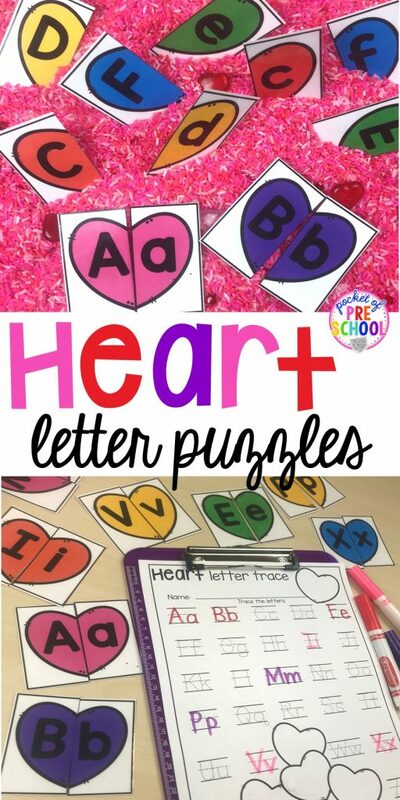 Need MORE heart printables for your little learners? Check out these from some of my favorite sites!